The month began with a statement by the country’s new Labour government that it was going to do things differently. For the first time since the revolution seven years earlier, the UK recognised the Soviet Union as the legitimate government of what had previously been Russia. In the world of football, Cardiff’s two victories over Arsenal at the end of January 1924 had left them top of the league and Arsenal in a difficult position near the foot of the table. Even Huddersfield with a game in hand but a worse goal average seemed well off the pace. Matters were not yet utterly desperate for Arsenal but things were approaching what had become the regular worrisome period for the club. And as if Arsenal had not had enough of Cardiff City after two defeats the Reds were drawn against them again in the fourth round of the Cup once more in Wales to make it three games against the Welsh team in succession. Not surprisingly Arsenal lost yet again to a side now utterly brimming with confidence; although at least this time the result was kept to just 0-1. A pleasant surprise was the appearance was the appearance for the first time since November of Arsenal’s solid defence – or at least four of them, Robson in goal, Mackie at right back, Kennedy at left back and Milne at right half. Extraordinarily the fifth member of the group, Butler, also played but at centre forward rather than centre half. Bob John was still injured but reports were that he would be back in a couple of weeks and the hope was that with a defence that was used to playing with each other the team could solidify around that and stop leaking goals. In between the football there was another of those small landmarks that pepper this era of technological change: on 5 February hourly signals from the Royal Greenwich Observatory were broadcast for the first time, allowing everyone with a radio to set their clocks exactly to coincide with official time across the kingdom. Back with the football, next up in the league was Sheffield United – a mid-ranking team who like most teams edging into the upper half of the table were very solid at home having won seven, drawn five and only lost two on their own ground so far this season. Unfortunately Mackie, who had been a rock at right back through the season, missing only one game, was injured in the Sheffield match and so was now replaced by Baker, and the defence was disrupted once again – although Graham who was looking a promising fixture at centre half in the absence of Butler, continued in that position. Arsenal’s away form was pretty much the reverse of Sheffield’s, having won three, drawn two and lost eight on the road. And so it turned out to be in front of a very modest crowd of 10,000 it was all over by half time with the score reading 3-1 to Sheffield. Arsenal did not have the wit or skill to break back into the game in the second half and focused on not letting things get worse, and at least they managed to do that: there were no more goals after half time. Blyth got Arsenal’s goal. It was his first of the season. As a result of the matches on this day Preston’s amazing rise had continued and they had now risen to 17th in the league. Arsenal however had sunk to 20th, one point ahead of Chelsea who occupied the first of the two relegation positions. The one thing in Arsenal’s favour however was that they had three games in hand over Chelsea. Although considering they had just lost three league games and one FA Cup game in a row, games in hand were not to be taken as any sort of guarantee of points. F0r the second league game of the month Arsenal were at home to Aston Villa, and the team shuffling continued as ever – but at the same time hope sprung eternal for at last Bob John returned. Butler got his second and final game at centre forward, and again didn’t score. In fact no one scored for Arsenal, as the Reds lost 0-1. This now made it four league and one FA Cup game in a row, all lost. Two goals scored, 11 conceded. But there was still room for some hope on 25 February with a home game against Sheffield United, and for the first time since 8 September 1923, the manager was able to able to put out his first choice selection in defence: Robson; Mackie, Kennedy; Milne, Butler, John. This game was played on the Monday afternoon because Sheffield United had an FA Cup game on the Saturday, which should have given Arsenal a further advantage. But although this Arsenal defence had done so well in rescuing the club the previous season, it had to be remembered that this was the defence that played the first four games of the season which the club had lost. Perhaps reuniting them was not such a great idea after all. Yes Arsenal still had those three games in hand, but if they carried on with the type of results they were now getting there was every chance these extra games would be of little use to the club. In reality it was only the poverty of the performances of Chelsea and Middlesbrough that was holding Arsenal’s collective head above water. It was certainly grim at the bottom, but at this point I would like to divert away from the gory details of the results at the wrong end of the table to consider for a moment the issue of Sir Henry and his absence from the country, and that of the way Knighton subsequently reported on Sir Henry. All the indications are that throughout the winter Sir Henry and his family continued their residence in the south of France. One firm indicator that they were away for the whole of the month comes from the fact that on 29 February there was the AGM of the Property Owners’ Protection Association in London an organisation that was central to Sir Henry’s financial well being, and a meeting he would most certainly have attended had he been in the country. The fact that he did not attend it (the minutes of the AGM show he was not there) shows just how much his life had changed; he was no longer the man at the heart of all the businesses that he had created. Just as he had pulled out of politics and was missing Arsenal games, so he was also not engaging in matters relating to his business interests. So, very briefly, here is the background. The Increase of Rent and Mortgage Interest (Restrictions) Act 1920 was the heart of the approach of post-war government to ensuring that property owners were not allowed to exploit their tenants by endlessly raising rents. The right to a home was being recognised in law, and in fact this legislation was incorporated 45 years later into the Rent Act of 1968 and is still the foundation of the notion of a balance of the right of the property owner and the right of the tenant, shows what a fundamental change in government thinking it represented. Nothing like it existed before this point, and it came as a huge shock to landlords across the country. Suddenly landlords who had as a matter of course gained excessive profits from letting out a dwelling could be fined up to £100 per house (about £5800 today). Also tenants could appeal against rent increases if the dwelling was in a state of disrepair and there were restrictions on the rights of owners to evict tenants. The whole move towards controlling tenancies was a huge shock to property owners and it is no surprise that the Association was debating the issue wholeheartedly. It is therefore a mark of Sir Henry’s need to miss the English winter, and his complete change in approach to business and the affairs that concerned him, that he was not there. And finally in this chapter now, staying with Sir Henry and what we know of him, perhaps I may add one more point here. Most people who know anything about Arsenal during this era will have heard the story that Sir Henry Norris interfered with on-the-pitch matters instead of allowing the manager to do his job. Indeed I have touched on this many times thus far. Knighton stated that the transfer fund was restricted to £1000 per player maximum, there were arbitrary regulations about players’ height, the manager had been ordered to wind up his scouting network, and there was basically a withholding of resources by a hands-on owner who was tight with his money. But the reality we have seen in these last couple of years is that Sir Henry was anything but hands on and in terms of the moving of Arsenal from Plumstead to Highbury he had been anything but tight with funds. A number of players were brought in at far beyond the £1000 maximum and indeed Sir Henry was slowly negotiating the possibility of Arsenal buying Highbury from the religious college that had been its landlords since 1913. Also we have seen he had been ill, convalescing in Italy and France, before finally having a house built in France. Now it is tempting to see the notion of convalescence to be that of a dilettante escaping the rigours of the English winter, but we must recall that as noted before this was the era before antibiotics including penicillin, and for most illnesses the suggestion of the doctor would be rest and a warm climate – advice which Sir Henry (being able to afford it) took. From the evidence I have been able to find it seems to me that Knighton, in his autobiography written over 20 years after these events, might well have been genuinely confused in his reminiscences. For example, if we take the issue of the £1000 transfer limit which Knighton says was imposed on him, we have seen a number of transfers go through that were considerably above this figure. So where did Knighton get £1000 from? In fact this was the limit that Sir Henry proposed to the League in the AGM of 1923 as a way of stopping the escalation of transfer fees. There is in fact no evidence that Sir Henry ever tried to impose this limit on Arsenal and the evidence is exactly the reverse. Knighton often spent more than that, but clearly the figure of £1000 stuck in his mind. Other allegations of Knighton, such as his endless hands on approach, however are harder to excuse as a mistaken memory. This winter of 1923/4 was the third in which Sir Henry was out of the country, rather than being endlessly directing affairs looking over Knighton’s shoulder. Also we have the report, discovered by Sally Davis, that Sir Henry took his turn for being the director with responsibility for the reserve team. If Sir Henry had been a man who wanted to oversee all aspects of the club and player selection, he would surely have ensured he watched every single league game. Likewise, would he have gone to watch the youth team under Joe Shaw when the occasion arose? It seems unlikely. Above all, nothing speaks against Knighton as much as the results, as this month shows. He was running the team, and Arsenal were sinking under his guidance. But we must ask, was this a deliberate falsification of the story or was Knighton simply getting confused? 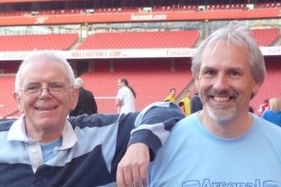 When Knighton wrote his memories he had been away from Arsenal for over 20 years, and seems to have had no access to any reference books on the club’s history (it seems very unlikely that he took anything with him when he was removed from the club) and had no access to any histories of his period at Arsenal since his was the first to be written. I am not suggesting he was suffering from dementia; he was only in his late 50s when he wrote the autobiography, but such information as we have suggest that by then he had retired from football and was eeking out a modest living as the secretary of a golf club in Bournemouth. Maybe he was simply getting forgetful and confused. That perhaps is what the misplacement of the £1000 issue suggests. We are currently evolving a series on Henry Norris at the Arsenal. The full index to all the articles is here. This index is updated as each new article is published.